According to the FDA release, there have been no pet or consumer illnesses reported from this product at this time. The recall was issued after “routine testing” by the FDA from a sample taken at a distributor. Eighty cases of this specific product lot were sold between the dates of February 23rd through March 10th. Consumers who touched this contaminated product should thoroughly wash their hands and disinfect any surfaces exposed to this product. Human symptoms from being infected with salmonella and/or listeria include: nausea, vomiting, diarrhea, abdominal cramping and fever. Infected pets may be lethargic, have a decreased appetite and abdominal pain and also exhibit diarrhea, fever and vomiting. 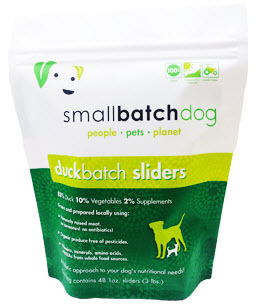 If you purchased frozen Dog Duckbatch Sliders from the affected Lot #CO27, do not feed or touch the product and return to the place of purchase for a full refund or throw them out where your dog, animals or humans cannot reach them. To read the voluntary recall release in its entirety, go to the FDA Recalls & Safety Alerts Page. Consumers may also call Smallbatch Pets Inc., at 888-507-2712 or email them at info@smallbatchpets.com.